A full model of the energy system has been built. All the constraints have been included and the model is continually populated with live, validated, data. Performance monitoring is performed and it includes the follow up of calculated equipment efficiencies using the validated data mentioned before. By auditing the energy system, imbalances can be detected and diagnosed. Therefore, the data can be relied on for evaluating the value of energy production and usage, and waste can be eliminated. 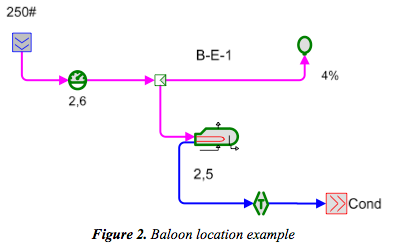 Planning for a better operation of the energy system by performing case studies is usually done by using the validated model in off line mode. Finally, it is important to mention that the optimization of operating conditions is performed on a continuous, day to day basis. As a result of the project, new sensors have been located and substantial savings in global energy costs have been achieved. Petronor operates the largest Spanish refinery with a refining capacity of eleven million tons a year. Its energy system is large and complex, requiring specific tools to help in control and auditing. In order to successfully address all the items mentioned above, a tool called Visual MESA has been used as the model and optimization engine. Visual MESA is a computer program designed to model steam, Boiler Feed Water (BFW), condensate, fuel, and electrical systems. It is an online program that receives live plant data from the steam, BFW, and electrical system metering. A complete model of the overall Energy System was built. The model includes the whole fuel, steam, boiler feed water, condensate and power system. Steam is generated in several different Units, with conventional boilers, heat recovery steam generators and a cogeneration unit with possible steam injection. Figure 1 shows a view of Visual Model at the highest Plant level. By navigating through the model, each individual Unit of the system can be monitored in detail. Total electric cost is determined from the net electric use of each motor, load, and generator times their respective electric prices. The electric generation (power selling) is just negative electric use. 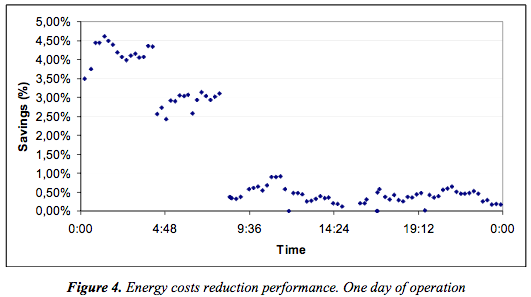 The model takes into account the electricity price corresponding to the actual hour of the day. •To store model error where the error exists for use when comparing one case to another (i.e., the actual operation against the optimized one). Since VISUAL MESA is an operational oriented tool, the proper training of the operating personnel is a very important project step. 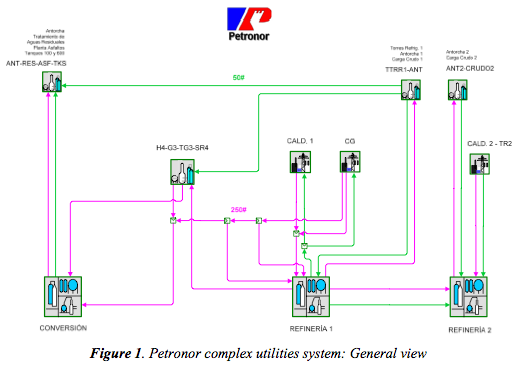 The different shifts have been trained by using the Petronor refinery model. Feedback from the operators during and after the training classes has been very useful to easier the day-to-day application, improving the report views and the displayed information. In order to illustrate the benefits already obtained, optimization results are shown in Figure 4. 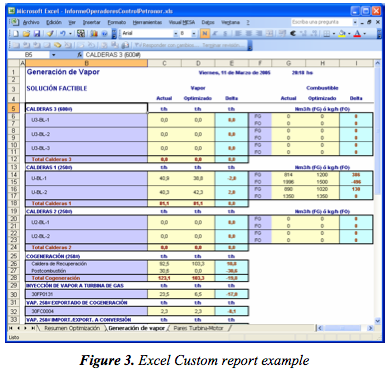 The results correspond to one day of operation by using Visual MESA. Savings are indicated as a percentage of total energy costs. An on line tool for auditing and energy costs control has been installed at Petronor refinery complex. It is important to emphasize the high involvement and motivation of plant operators since the beginning of the implementation. Coordination amongst plant areas in order to implement the proposed optimization recommendations is also a critical issue, so management involvement is crucial. The robustness of the tool helped operators to gain confidence on the system.